Plain clothes anti-terrorist police are patrolling the public transport system in London for the first time. British Transport Police have also said more people using the Tube will be randomly stopped and searched. A spokesman stressed the moves had been planned for some time and were not a reaction to the attacks in Madrid. Posters are being put up to encourage public vigilance, while Defence Secretary Geoff Hoon has urged people to report anything unusual to police. British Transport Police Deputy Chief Constable Andy Trotter emphasised no specific threat to the London Underground or rail system had been received. Do Tube users travel in fear? But he said London was on high alert and passenger vigilance was "crucial". "With three million travelling every day, they can provide millions of eyes and ears across the whole system", he told BBC News, urging travellers to call police if they see "anything suspicious". He said the transport system would only "remain safe as long as we all work together to keep it safe". The Met's ongoing review of Tube security had been "thrown into stark relief by those awful incidents in Madrid", he added. "We are throwing everything we've got at this because it is the number one challenge for us." A British Transport Police (BTP) spokesman said extra patrols, using plain clothes and uniformed officers, were being carried out at Tube stations and on trains. But there are fears this could leave the BTP overstretched. BTP Federation chairman Alex Robertson told BBC News an extra 200 staff across the UK were needed to cope with the increased threat of terrorism. 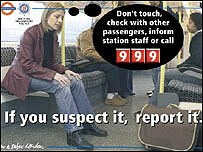 The BTP has also announced a poster campaign for Tube stations, urging people to keep an eye out for unattended bags. 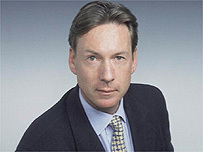 Urging passenger vigilance, Mr Hoon told BBC One's Politics Show: "If there are any packages, any briefcases and suitcases that don't appear to belong to any particular individual they [passengers] should ask each other. "They should bring it to the attention of guards and those in authority." He also said 14 "rapid reaction groups" of reservist troops across the country had been made available to help civil authorities "at very short notice" in the event of a crisis. UK rail regulator Tom Winsor said security measures had been taken, including, removing litter bins but there was always going to be a danger with land transport because explosive devices could also be placed on tracks. "3 million passengers use the underground every day"